The manual that's included with the Canon EOS 5D Mark II is a great starting point for learning the camera, but it's definitely not the only place you should be getting your information from if you intend to master your 5D Mark II. If you don't have the manual, you can download a copy of it here from Canon's website. It's great for learning the basics of the camera, but sometimes it can be vague and hard to follow. In order to capture the full potential of the 5D Mark II, you need to go a little bit deeper. Here's a list of books that you should find helpful. I'll also include some links to a few online stores where you can purchase new versions. I won't be listing used books here since they come and go more quickly, but always check for used books first, since they will almost always be cheaper than new ones, and in most cases, in just as good condition. You can look for used books using Google Product Search, Amazon, AbeBooks, Half.com, or other online marketplaces. Prices below are as of August 29th, 2011. 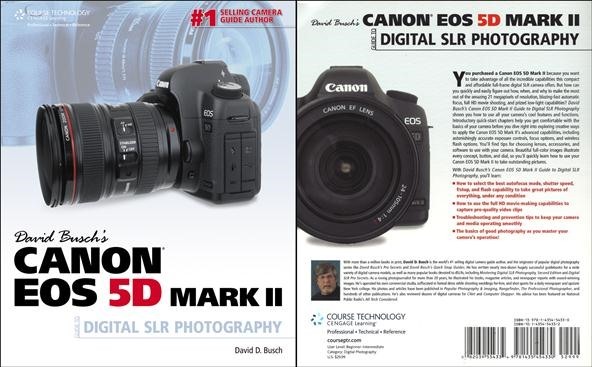 It's a pretty big title, but "David Busch's Canon EOS 5D Mark II Guide to Digital SLR Photography" is a must-have for anyone with a Canon 5D Mark II. It's especially good for those new to digital photography, but it's also great for someone looking to beef up their skills. As of right now, it's the best book out there for this camera. David Busch is not just a well-respected photographer, but an award winning author who's had more than 140 photography books published with over a million total in print. Twelve of those books are currently in the Top 100 in Amazon's Digital Photography section. His Canon EOS 5D Mark II Guide to Digital SLR Photography is number 50 (his 7D book is number 34) and it's the number 1 book for the 5D Mark II. The structure of the book is pedagogically sound, well organized, and it guides you effortlessly through all of the technical and operational facets of the camera. Busch elaborates on the user manual and covers everything from simple tasks to more advanced tips and techniques that 5D pros would even appreciate. There's 13 chapters divided into 4 sections. Helps you get started with your Canon EOS 5D Mark II, covering setup, basic shooting modes, and all of the features. Goes beyond the basics, covering bracketing, exposure, HDR photos, autofocus, Live View and shooting movies. The above two sections help you get around your camera and become a decent photographer, but this section takes you to a completely different level. This one covers advanced tools, showing you how to customize your experience with shooting, playback, setup, and the custom function menus. It also covers in detail Canon lenses, light, electronic flash, and wireless flash. The last section is all about enhancing your experience and working with image editing software like EOS Utility and Photoshop, and also goes over some troubleshooting information for things like firmware issues, memory cards and sensor problems. All great books aren't without errors. On page 3, there is mention of a built-in flash. The Canon 5D Mark II doesn't have one. On page 58, the picture of the Canon 24-105mm zoom lens that comes with the 5D Mark II kit incorrectly mislabels the zoom ring and focus ring (they should be switched around). Page 304 has a minor (but important, depending on who you are) typo: "Sharp-eyed readers will wonder why the black band is at the bottom of the frame rather than at the bottom..." should say "Sharp-eyed readers will wonder why the black band is at the bottom of the frame rather than at the top...". Busch lists a few of these typos on his website's errata page. These goofs aside, it's still the number one book out there for getting started with the 5D Mark II, and the following books just don't compare. 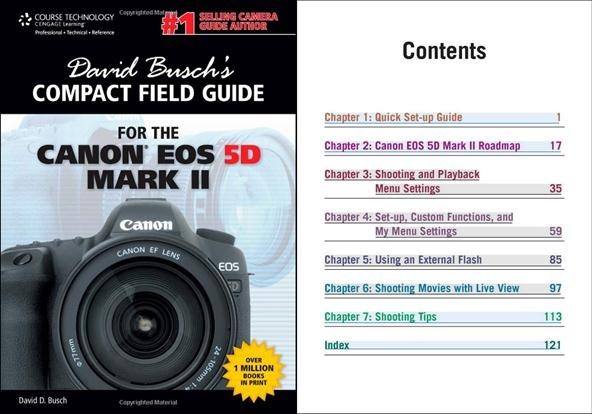 Not to sound like a David Busch nut, but his books are truly the best on the 5D Mark II, and his "Compact Field Guide" is a good book to have when you're new to the camera and want something more than Canon's user manual, but something less bulky than the book above. It's basically a slimmed down version of his other book, but omits the more advanced techniques and the software and troubleshooting section. This is geared towards beginners, and those already proficient with their 5D Mark II needn't spend the money on this. But if you're a newbie, it's a valuable tool to have in your camera bag. 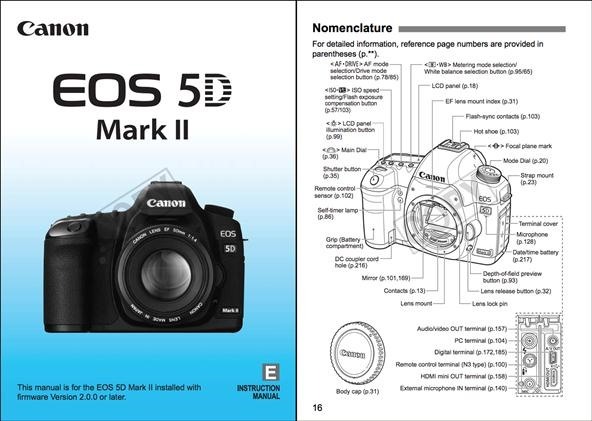 The "Canon EOS 5D Mark II Digital Field Guide" is very similar to the Compact Field Guide above. It goes into depth more so than Canon's user manual, covering the features, menus and settings, as well as customizing the functions, using lenses and Speedlites, and shooting video. But it also embarks on general tips for digital photography, specifically covering sporting and concert events, landscape and nature shots, and also travel, portrait, stock, editorial and wedding photography. There's even some handy maintenance tips for your camera. Overall, the book could use some work, because it seems to be a slight rehash of the older "Canon EOS 5D Digital Field Guide" book. Some of the newer functions are not explained, and some of the step-by-step instructions are not 'step-by-step' at all, missing a few key parts. Still, with all of its errors, it's a decent book to have around in addition to Busch's, mostly if you want some tips on basic photography. 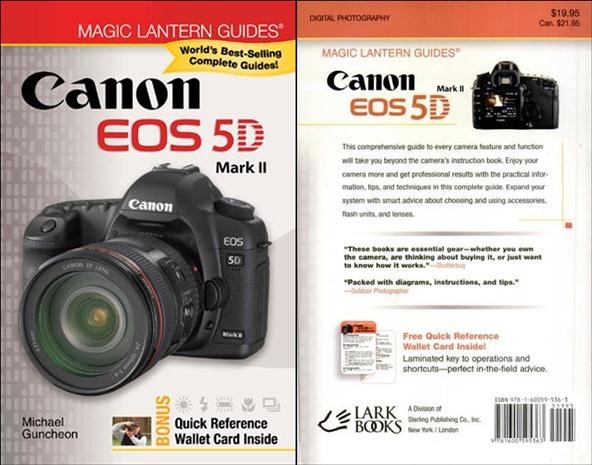 If you want something a little more colorful than the basic user's manual, "Magic Lantern Guides: Canon EOS 5D Mark II" is the book for you. There's not much else besides what's already in the user's manual. 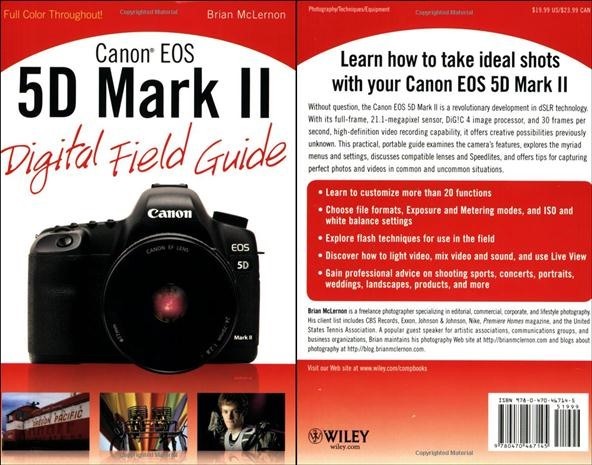 There are some occasional tips from the author, but overall this is the 'manual' Canon should be supplying with the 5D Mark II, so I wouldn't pay more that 10 bucks if I were you. The 'Quick Reference Card" is pretty handy for sticking in your bag, though. If you're a complete newbie to the camera and haven't lost it yet, make sure to stick Canon's "EOS 5D Mark II Pocket Guide" in your camera bag, which very briefly discusses the menus and modes. Also, the "Canon EOS 5D Mark II CheatSheet" by Bert Sirkin is a bigger and badder version of Canon's Pocket Guide, laminated and in tiny print to provide maximum information. If you want something compact for your pocket, this is what you should get. 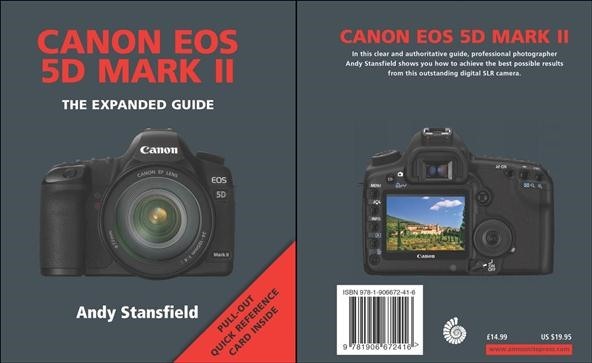 There's also the "Canon EOS 5D Mark II: The Expanded Guide" by Andy Stansfield, but it's not much better than the manual. I would stay away. Know of a better book? Let us know in the comments below. *** Borders is going out of business, and all of their digital photography books in stores (not online) are currently 50% off. In the coming weeks, the discount might even get bigger. But if you live near a Borders bookstore, go in and try and snag one of the books above for half off. Busch's guide is pretty awesome, if you overlook the minor mistakes. It's the best book out there for the Mark II, but definitely not the end of the line for photography tips. There's hundreds of books I've gotten tips from for shooting with DSLRs. I'm not much for sticking to one reference when there's so much more information out there. You just have to pick and choose. But for learning the 5D, Busch's guide is great.